Thank you so much for response to my tweets about the recent publication of Safe for Whom? by Melissa Cheyney et al. and your suggestion to submit a Letter to the Editor. The format for Letters to the Editor is too restrictive, so I decided to share my concerns in this open letter. Simply put, dear Editors, what were you thinking? Melissa Cheyney has lied, denied, decried and defied efforts to inform the public of the hideous death toll at homebirth. Did you actually solicit an opinion piece from a LAY midwife, indeed the lay midwife who has single-handedly done more to hide the growing toll of tiny bodies of babies who succumb to American homebirth than anyone else? Melissa Cheyney has lied, denied, decried and defied efforts to inform the public of the hideous death toll at homebirth. Did you know that Cheyney, like all American “certified professional midwives” (CPMs) is grossly undereducated, grossly undertrained and fails to meet the standards for ALL other midwives in the industrialized world? Did you know that the CPM credential was fabricated from whole cloth by lay people who couldn’t be bothered to get a real midwifery degree, but wanted to hijack the excellent reputation of American certified nurse midwives by awarding themselves similar letters after their names? Cheyney explained … due to some state regulatory boards having very hostile relationships with midwives, the quality and quantity of data submitted might be adversely affected if regulatory authorities were provided access. These were the statistics that Melissa Cheyney tried to hide. Did you know that in her role at Director of Research for the Midwives Alliance of North America (MANA), the trade union that represents homebirth midwives, Cheyney REFUSED for 5 years to release the mortality rates from a MANA survey of nearly 20,000 homebirths from 2004-2009, hiding them until 2014 when the pressure became too great. Undoubtedly you know that Cheyney ultimate published the results in Outcomes of Care for 16,924 Planned Home Births in the United States: The Midwives Alliance of North America Statistics Project, 2004 to 2009. Did you read the paper? If you had, you would have found that comparing Cheyney’s death rate at homebirth of 2.06/1000 with the CDC death rate for low risk white women (ages 20-44, at term, with babies that are not growth restricted) of 0.38, we find that homebirth has a death rate 5.5X higher than hospital birth. 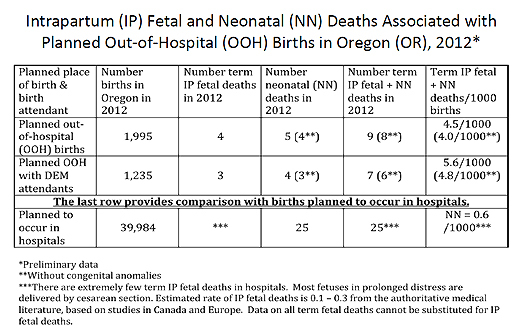 In other words, the death rate at homebirth is 450% higher than comparable risk hospital birth. You can also be sure that the authors understood that their data showed that homebirth has a horrifically high death rate, because they try to hide the number of deaths for the past 5 years, released the data only under pressure, and then proceeded to draw a conclusion entirely at odds with what their own data showed. In addition, you can also conclude that homebirth is NEVER appropriate for breech, twins or VBAC. Finally, you come away from the paper with the horrifying realization that MANA has absolutely no idea what its own members are doing. There is no systematic attempt to determine if they are safe practitioners. Is it any wonder then that Cheyney, who has spent years hiding the death toll at homebirth in her own state and across the country dismisses even the idea of homebirth safety by asking “safe for whom”? 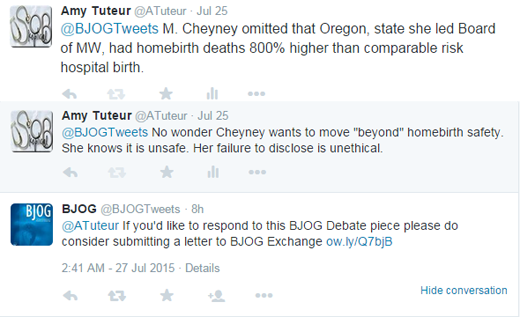 It was grossly inappropriate to solicit a commentary on homebirth safety from Melissa Cheyney, a lay midwife who has spent her career lying about the death toll of American homebirth. BJOG should retract Cheyney’s latest effort at obfuscation and apologize to its readers for soliciting her opinion in the first place. Compare the deaths during homebirth (documented here are at least a dozen a year) to the deaths over a DECADE blamed on GM for a faulty switch. The CEO was called before Congress! The number is now estimated to be around 100, but still it was over a decade and spread out over thousands of vehicles driven hundreds of thousands of miles. There is a compensation fund for the victims and survivors. What is MANA doing to compensate the loss families? Why hasn’t Congress called her and Jan Tritten and other Elder Midwives to account for the hundreds of babies lost or harmed during the last decade from shoddy care at home? Completely off topic, but I was wondering if any of the Aussie doctors that visit here can answer: How much of a say does a hospital doctor get in end of life treatment plans? My mother is currently blaming the doctors for whats going on with my grandfather – “They stopped his cardiac meds because he can’t swallow safely and they can’t be given via IV, they decided its time to stop supplementing oxygen, having an IV, antibiotics, etc.” and I didn’t think that doctors were able to decide those things? Nothing to add in regard to this treatment, but I am so sorry for you and your mum. Death is never pleasant but it’s horrible when it feels like things are being decided without proper explanation or consultation. I hope things get sorted out so that your grandpa is comfortable at the very least. Thank you, but don’t feel sorry for her. She’s the one with medical power of attorney, has been making the decisions and blaming the doctors, and has kept my grandmother away from her love of 62 years while he was dying. She also said he was in a coma, the nurses said otherwise. It’s a mess. He passed this morning, my sister and her husband were with him thankfully. Oh, I’m so sorry. It sounds like a very difficult time. So sorry to hear all this and for your loss. And I’m sorry your mother’s behaviour has made the time more traumatic than it otherwise was. Thank you. She managed to infuriate all the nurses – we apologised for her behaviour without mentioning her name, and the nurses knew exactly who we talking about. One had a quiet word with my sister and let her know what had been going on. Thanks for that. I personally want reasonable measures, but that really is a broad range and very variable. That’s what they did for my MIL’s home hospice care. It made things more comfortable for her and easier for my husband. They even got a hospital bed in her room. Thanks. I vacillate between numb and sad. We have Chris’ cousin Bruce & his wife Rita here and she’s cooking (we don’t feel like it – thank God for Eat24.com). Chris is numb cries sometimes. He cried when he saw her cat Morrie laying in bed with her after she died, just like when she was alive. Their is good evidence that the withdrawing the things you mentioned – water (usually IV therapy), food, oxygen and antibiotics do not shorten the duration of life. In fact j. My experience sticking needles I patients who are end stage, forcing them to wear oxygen masks etc (because it usually is “force” they are uncomfortable and awful) reduces quality of life. This is seen in the fact that often when active care like this is withdrawn patients rally briefly and feel much better. Thank you, I appreciate it. Its just frustrating, especially since we lost two other grandparents, ultimately to pneumonia, and they both went within a few hours of care being withdrawn. Contrasted to what turned out to be 5 days in total without anything, and it seems like torture to us. My siblings and I are all hoping that euthanasia is available before its our turn. Wishing him a peaceful, pain free passing. Safe for whom: not for mothers, and not for babies, and not really legally, ethically, morally safe for CPMs. So safe for whom? Indeed. I spent the last few years in the same town as MC. She isn’t available for hire to the general population, I hear she works by referral only. And I hear that she isn’t particularly great, even as far as CPMs go . . .
I’ve read the MANA stats paper from beginning to end several times, and every time I look at it, I find a new fact to be horrified by. I can’t believe people are still citing that as evidence of safety. Take Jan Tritten as an example of someone who cites the MANA stats as proof that homebirth is safer than hospital birth. So Jan completely ignores the death rate. Instead, a favorable outcome is determined solely on the basis of whether birth was ultimately by cesarean section. Of course, Jan also fails to acknowledge that the hospital cesarean rate applies to a very different cohort than the low-risk mothers having homebirths. So Jan takes the safety of homebirth as axiomatic. No amount of evidence, however strong, can convince Jan that her fundamental assumptions are wrong. Also, notice the disparagement of all but like-minded people as uninformed. Jan has always known what she knows, so it has to be true. Indeed, comparing the c-section rate of MANA’s patients to that of American women as a whole is incredibly dishonest. About 2/3 of their sample was multips with no prior history of c-section, a group which is pretty unlikely to need a c-section regardless of place of delivery. My back-of-the envelope estimate was that if all of their patients had given birth in the hospital, maybe 9 or 10% would have wound up having a c-section. And most of the 44 dead babies would have lived. All Cheyney cares about is that homebirth continue to be safe for lay midwives like herself. Ahem. British Journal of Obstetrics and *Gynaecology*, if you please. And you should do the proper, publishable version of this letter, just need to write in that delightfully restrained( or is it passive aggressive) manner so you can trample all over the lies in a genteel sort of way! And I second araikwao-saddle up to British understatement-devastating when done well, as I’m sure you could-and hit ’em hard. No, actually the o in ‘foetus’ is incorrect, and the Americans have it right. Fetus comes from the Latin fetare = to grow. Latin scholar here. The o was added in error. Apparently the Americans also have it right with ‘aluminum’ rather than ‘aluminium’. Okay I’m having bad cognitive dissonance right now. Bear with me, I’m trying to grow through all this. You know what would help your cognitive dissonance? If we all agreed to stop spelling English using the French transliteration of how everything was pronounced 600 years ago. Okay that sounds like a positive step. How are we going with aluminium v aluminum? Why did they toss in the extra “i”? Is it the inverse of the silent ‘e’? As in, silent e’s are there but not pronounced, vocal ‘i’ isn’t actually there but IS pronounced? Are there any other words where this happens? I live in MA, so plenty of people don’t pronounce things like r’s, but its rare that extra, pronounceable letters show up. To bring it in line with other metals. several of them end in “ium” but only aluminum lacks that “i”, to my knowledge. That’s what I get for making claims right after waking up. If you need me, I’ll be in the corner of shame. That is my favourite metal. Except I always say “Molly-be-denim” in my head. It has had the second ‘i’ for as long as I’ve been able to read-say 45 years…never seen it spelt with just the one. Though I’m aware of the american pronounciation from tv shows, or as we used to say here, ‘programmes’, though we’re now spelling it ‘programs’. Nowhere. Just.don’t. For the love of all things don’t go there. ‘Aluminium’ can’t go anywhere. I just bought a rice cooker, and my health nut friend said I should be careful using it because they ‘all’ have aluminium bowls…ominous silence. I responded that I felt we were really sunk, since mine is teflon, and left her gaping. Such a risk taker I am. As a fan of The Straight Dope, I feel the need to post this. The initial question was a little silly, but I found it a great read. It cured me of ‘peni’ and ‘virii’. Same. I just can’t get over ‘aluminum’. Yeah, I’ve no interest in one upping about which dialect of English is more technically correct or whatever, but it would be a good idea to spell the name of the journal correctly in the post. Just looks better. I do hope you also submitted this excellent piece to the BJOG Exchange as they suggested. The section Cheyney’s article appears in is called BJOG debate. The topic is “homebirth is unsafe” and the FOR article is written by 5 doctors and one adjunct professor of obstetrics. The AGAINST article is written by Cheyney (anthropology) an instructor(?) in public health, and a bioethicist. Frankly, it appears they just couldn’t find anyone to write the AGAINST article that has an ounce of credibility. I agree-this should be requoted as much as possible. Concise, etc. Clinical village is brilliant because it plays on the womyn wisdom/wise granny trope. I’ve said it before, and I’ll say it again. How do you sleep at night, Melissa Cheyney? You claim to be a feminist, yet you are behaving like the worst sort of patriarch, essentially telling us to stop worrying our pretty little heads about the safety of homebirth. YOUR OWN DATA DEMONSTRATES THAT HOME BIRTH IS DEMONSTRABLY MORE DANGEROUS THAN HOSPITAL BIRTH!!! Do you really think that most women would prefer to avoid a c-section at the expense of a dead child? Do you really believe that women deserve substandard healthcare providers? Because that is exactly what you are promoting by continuing to advocate for CPMs/DEMs/LMs when we all know that the CNM is the only credential equivalent to that held by midwives in other developed countries. 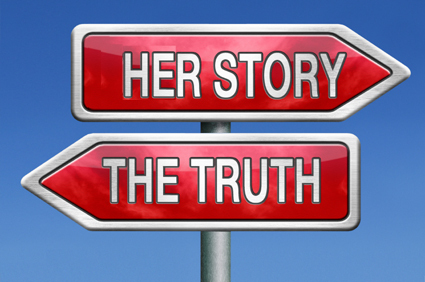 The only reason that you want us to move beyond the “polarizing debate on whether homebirth is safe” is because you know that it is not safe, and that the only way that you and your ignorant cronies can continue to indulge in your birth hobby is by painting this as an issue of feminist choice. You should be ashamed of yourself. Does she have ANY related “clinical training” whatsoever, or is she just making it up as she goes along? Meaning what? She DECIDED to pursue? That makes it sound conspicuously like she has not ACTUALLY PURSUED any such degree. PS Hey, I just “decided to pursue” an MD. Now y’all have to listen to all my medical advice and opinions, because I’m basically the same as a doctor! I decided to pursue my pilot’s license. Step aside, I’m flying this sumbitch. I’ve decided to pursue being a trillionaire. I’d like to buy your house as part of my upcoming real estate empire. Would you take a check?